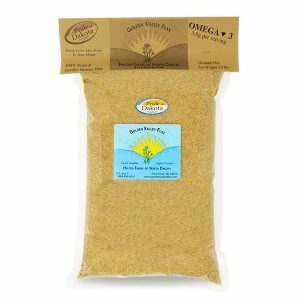 Natural Ground Flaxseed Recurring Subscription. Golden Valley Flax. Brimming with nutrients that are needed for good health, our Natural Ground Flaxseed is grown on our 4th generation family farm. Our ground flaxseed is gluten free and non-GMO (non-genetically modified). Properly stored, ground flax remains fresh for months. 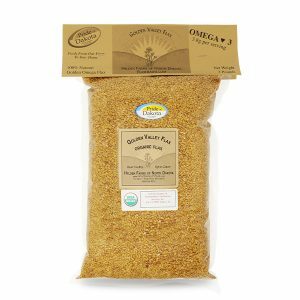 Ground flax is made from food grade pure whole flaxseed. We run the whole flax through a very expensive mill and the uniformly ground flax is the result of our efforts to make all of the benefits locked inside the seed available for your good health. 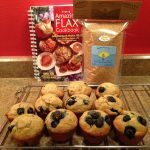 You can buy either whole flax or ground flax, there are good reasons for both. Regardless of your choice you need to grind the flax to unlock all of the health benefits found within the seed. There are times when the beauty and texture and crunch of the whole flaxseed enhances your recipe. Some people also prefer a more coarsely ground flax product and a coffee grinder and whole flax will give that to you. However for those who prefer convenience, we grind it for you. Therefore the choice is yours, either way you are buying awarding Golden Valley Flax, fresh from our farm to your home. 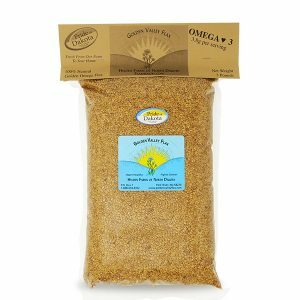 Golden Valley Flax’s ground flaxseed is brimming with Omega 3s, fiber, and lignans (that support the immune system), and other nutrients. “I am 83 years old. Since I started to take Golden Valley Flax, I just feel better. I have more energy, my skin and hair is nicer. And, best of all, my cholesterol is lower!” Mary from Texas. 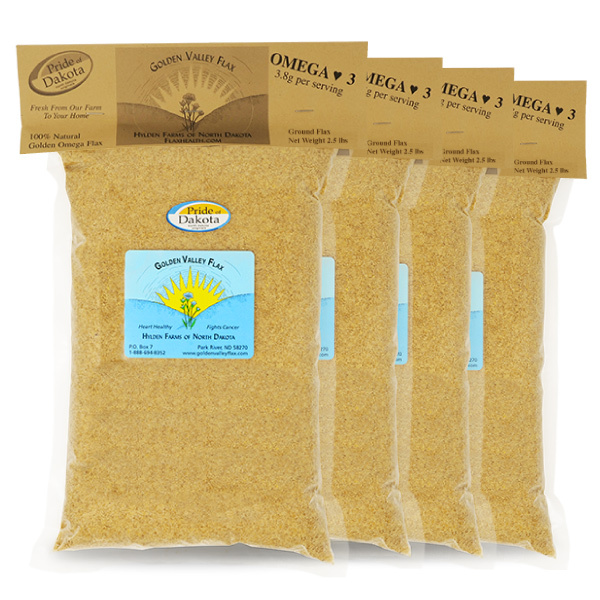 Ground flax remains fresh for months when properly stored in the ziplock bag provided. Keep it airtight and cold. Ground flax stored in a freezer will still flow and be easy to use. It will not become solid because of the high oil content. You can just spoon it out of the bag and improve your health. If you want assistance with your ground flax order or any other of our flaxseed products, please reach us via our contact form, by phone (1-888-694-8352), or email. Thank you for visiting Golden Valley Flax!